No credit check loans online may not be all they seem even with they come from peer-to-peer platforms. Your credit report is there to help you get a loan, to show lenders that they can take a chance lending you the money you need. So why is it that for so many people, a credit check for a loan becomes a nightmare? In response, a lot of companies offer loans with no credit check but it turns out these loans may lead to a nightmare from which you can’t wake up. The idea of no credit check loans sounds great. For some people, it may seem like the only available option. The problem is, that’s just not how the world works. A credit check is there so a lender knows how much risk is in the loan and how much to charge as an interest rate. If a lender is offering you a loan with no credit check…you can be sure there’s something else in it for them. Super high rates and intimidation are just two of the traps no credit lenders will use. Understand the pitfalls of zero credit loans and the better alternative even with bad credit. That doesn’t mean you can’t get a loan without a credit check or that they’re all bad. I’ll show you what to watch for in peer-to-peer lending, no credit loans and how to make sure you’re getting the best deal possible. I’ve been exactly where you are now. I destroyed my credit in 2008, missing payments on mortgages and sinking my credit score. My FICO was under 550 and I couldn’t even get a high-rate credit card. It’s when you’re in this situation that the no credit check lenders come sniffing around for weakness. They agree to loan you a very small amount, usually less than $1,000 and for no more than a few weeks. This reduces the risk for the lender because they have your checking account number and can keep hitting it for withdrawals looking for their money. In return, the lender usually charges a fee of $15 or more per $100 loaned. Wonder why they charge a fee instead of an interest rate? Because most states have laws against charging borrowers interest rates above 36% a year. By charging a fee, the lender can charge as much as they want and not worry about regulators. Those fees are actually equal to around 500% interest! How Does P2P Work for Bad Credit? There is an alternative for no credit check loans which we’ll talk about in this article. Peer-to-peer lenders are a new type of loan for bad credit, one that is making these types of loans more affordable. P2P lenders will check your credit but have much lower credit score requirements than other lenders. This means even bad credit borrowers can get a loan and at interest rates you can afford. I’ll review some of the peer-to-peer lending sites I used after ruining my credit and which work best for bad credit borrowers below. The upside is that since the loan goes on your credit report, it will help build your credit with every payment and help you get future loans at a lower rate. While credit scores have been improving since the 2008 crisis, there is still a big portion of the population that can’t get access to affordable loans. Lenders generally classify people in one of four segments when they do a credit check: super-prime, prime, sub-prime and below sub-prime. Super-prime borrowers have credit scores above 740 on the FICO scale of 350 to 850 while prime borrowers are generally those between 680 – 739 FICO. These borrowers will have little difficulty getting a loan with a credit check. Recommended lender SoFi for super-prime and prime borrowers offers some of the lowest rates among peer-to-peer lenders. They don’t disclose the credit score you need for a loan but I see just 5% of the people I recommend from the blog get approved. It doesn’t hurt your credit to apply though and they offer personal loans, mortgages and student loan refinancing at rates the other sites can’t touch. But if your credit score is below 680 FICO, you're not alone and you'll probably have a tough time getting a loan from a bank or other conventional lender. Then there’s sub-prime borrowers that have credit scores between 550 and 680 FICO. A credit score in this range may not even be the result of missed payments but just a lack of credit history. 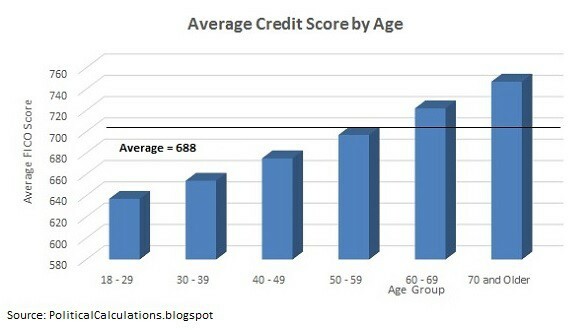 Much of the population under the age of 39 has a sub-prime credit score just because they haven’t yet built their score. Most banks won’t lend to sub-prime borrowers, especially after the 2008 financial crisis. You might be able to get a car loan from a buy-here-pay-here dealer. Even options for an online peer to peer loan are limited with PersonalLoans one of the only lenders to issue personal loans to sub-prime borrowers. I’ve used the PersonalLoans platform myself a few times for consolidation loans and a home improvement project. For anyone with less than stellar credit, it’s one of your best options before looking for a no credit loan. I also like Upstart for p2p loans because of its unique loan model that takes into account educational achievement. It means that even recent graduates and younger borrowers with no credit score can usually get approved for a personal loan. Worse off is the group with credit scores below sub-prime. A single missed payment can take up to 70 points off your credit score and a foreclosure can drop it by 100 points or more. Have anything less than stellar credit before a misstep and you could easily fall in this category. While the average FICO score falls in the range for prime borrowers, a huge section of the country is in the sub-prime and below groups. In fact, more than half of borrowers under the age of 29 have credit scores below prime. The lack of options for sub-prime and below force many people to just give up. They start worrying so much that a lender will run a check on their credit score that they just go immediately to no credit check loans, normally through payday lending or cash advance stores. There’s really two reasons why lenders are able to do loans with no credit check, high rates and very quick repayment terms. Rates on payday loans tend to be as high as 500% on an annualized basis. Even if only one person in every three pays back their loan, the lender has still made 65% on its money. Since the loan is only for a couple of weeks, the lender can get their entire profit quickly without having to wait years like legitimate lenders. While there’s no credit check with these lenders, they will get your bank account information. If you don’t have money in the account when the loan becomes due, they’ll just keep hitting it until they get the money or you close the account. Since they are local stores, they may even try ‘visiting’ you at home or work to get their money. It makes no credit check loans much less attractive when you know how they work. What are You Really Getting with a No Credit Check Loan? So a lot of borrowers turn to the endless offers online for loans with no credit check. Fear of being denied credit is so strong that I’ve even seen borrowers with good credit scores run to these websites. We’ll get to boosting your credit score so you don’t need no credit loans next but first I wanted to make an important distinction. There are some direct lenders and peer-to-peer lending sites advertising no credit check loans but in the fine print, saying that your application is taken with no check on your credit. If your application is accepted, then they check your credit to offer a rate on the loan. These aren’t true ‘no credit check loans’ but we've seen that you don't really want those true no credit check loans. A truly no-credit loan will not need to look at your credit report and may not even need your social security number in the application. You’ll only need to fill out your contact information, employment and banking information. There are a lot of p2p lending sites to choose from and most offer similar rates. Start with figuring out which lending sites will loan to someone with your specific credit score and then compare sites on fees and features. For credit scores above 680 FICO, start with either SoFi or Lending Club. Of course, if you have a credit score above 680 then you’re probably not looking for no credit check loans in the first place. Borrowers with credit scores between 580 and 680 can usually get a loan from sites like PersonalLoans or Upstart. Neither site charges a fee for prepayment so you can refinance your loan at a lower rate after your credit has improved. Finally for really bad credit borrowers, NetCredit will make shorter-term loans at rates that are still lower than no credit check payday alternatives. Remember, applying for a peer-to-peer loan doesn’t affect your credit score until you accept the loan. That means it’s best to check out a couple of sites to see who offers the best rates on your loan. Besides applying on different sites, there are a few other tips to get lower rates on your loan. Apply for only as much as you need. It will keep your payment low and rates on small loans are lower. Apply for a loan on 36-months or less but not under a year. Give yourself enough time to pay off the loan but shorter-term loans are usually made at lower rates. Pay off your loan or refinance it as soon as possible. Even the best p2p sites will charge between 12% to 16% on bad credit loans so you want to ditch that debt as soon as you can. There are a lot of loan sharks dressed as online lenders so you do have to be careful. Besides avoiding loans with no credit check, you’ll also want to watch for some of these warning signs. Lenders that only make loans of one-year or less. Even a small loan is going to have higher payments if you have to pay it off in less than a year. Any site that says, “No Credit, No Problem” or something like that should be avoided. A lot of good peer-to-peer sites will lend to very bad credit borrowers but they still care about your score. Avoid sites that try to get you to borrow as much as you can. Good sites should be partners in your loan, helping you get the right loan at the best rate. Always look for an Annual Percentage Rate (APR) on your loan. 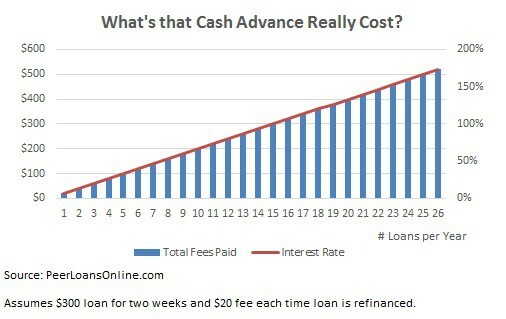 Even lending sites that charge a fee have to disclose the APR-equivalent interest rate. Compare this with the rate you’re paying on other debt. The equivalent interest rate is usually in the 100% or higher range and will cost you hundreds in interest even on a small loan. 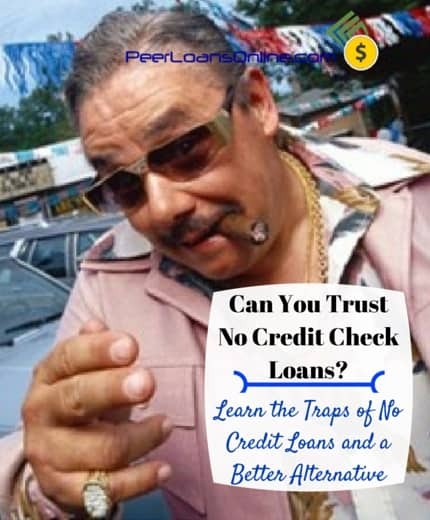 I’ve seen a few no credit check loan websites market themselves as peer-to-peer lenders where investors make loans to borrowers instead of using a direct lender. Borrowers like p2p because rates are generally lower and there are so many investors that funding happens very quickly. Many of these loan sites might not be true peer lending platforms. Some just use the name but only have a small group of investors that are bankrolling the company. These sites have limited funds to lend and will charge near-illegal fees because they don’t need to make a lot of loans. True peer-to-peer lenders like SoFi and Upstart will draw from tens of thousands of investors to fund loans and offer lower rates. FICO reports that it can take up to 10 years to fully recover your credit score after a bankruptcy and as much as nine months just to get back after a missed mortgage payment. Most people can’t wait that long to increase their credit score to the point that a credit check doesn’t destroy their chance at getting a loan. Fortunately, there are some things you can do to bump your credit score enough to get a loan at an interest rate you can afford. I covered three credit score hacks in a recent article, all of which I used to boost my credit score 140 points over a couple of years but that also work within a couple of months as well. Get your credit limit increased on cards or any revolving loans. This doesn’t mean spend more but the higher limit makes it look like you are in better financial shape. Consolidate your debt into one personal loan. This can help reduce your monthly payments and change the type of debt on your report. I like PersonalLoans because there’s no origination fee and the lending requirements are a little lower for bad credit borrowers. Pay down as much debt as possible for a few months. It will only take a few months for your credit score to increase 20 or 30 points but you have to focus on your debt. Understand what makes up your credit score and how to play the credit score game. There are a few hacks you can use to increase your score but it's mostly just a long-game of making payments and protecting your FICO. Debt consolidation is the most popular use of peer to peer loans and can significantly lower your interest rate. Paying down your debt consolidation loan will help to increase your score by adding to your payment history and changing the type of debt from credit cards to non-revolving credit. As much as peer-to-peer lending has helped me, helping to get the money I needed after destroying my credit score and helping to rebuild my credit, there are alternatives that you should know about. There are sites like GoFundMe that will allow you to create a social lending project and ask people to contribute. You need a very strong social network and most of the funding to these crowdfunding projects comes from friends and family but you don’t have to repay the money. You might consider getting a small loan from these sites or from family until you can increase your credit score enough to get better rates from p2p sites. Loans with no credit check are riddled with traps and small print that can destroy your finances. I understand that everyone gets in a bind and maybe can’t wait a couple of months to improve their credit score but these no credit online loans and payday cash advances are not the solution. Start working on your credit now so you can pull yourself out of the bad credit cycle of borrowing money to pay high interest debt.